A one-time price of $39.99 will be added to your order. All American Retro Bowling Style shirt. 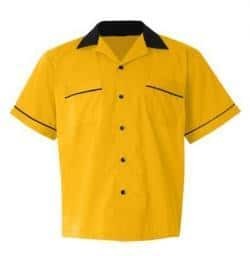 Fantastic, practical, cool looking retro style shirts, great for Teams, Groups, Clubs, Staff or Corporate styling and many more uses. Practical Poly-Cotton fabric make these ideal for Restaurants, Bars, Clubs, Resorts etc. Machine washable easy-care. available in ANY size or color combination you need.